One of the questions we're often asked when we post historical portraits and fashion plates is "Where are the larger ladies?" (See here and here.) Much of the answer to this is perspective, and what qualified as plus-size in the past. Because of diet, environment, activity, economics, and genetics, Western women living 250 years ago were generally smaller in every way than their modern counterparts. 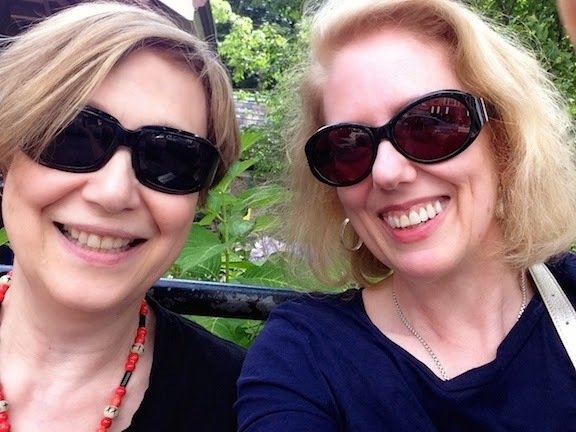 (Consider how many miles Jane Austen's heroines walk in the course of every book!) But in any era, there's no "standard" size for women, and in the past as in the present, there were women of every size and shape, and perfectly happy that way, too. Which brings us to this lovely portrait of Madame de Saint-Maurice, painted by Joseph Siffred Duplessis in 1776. Like many wealthy French ladies, Mme. de Saint-Maurice chose to be painted at an intimate moment in her day, sitting at the looking glass on her dressing-table. While she's having her hair arranged, she's wearing an embroidered dressing-gown of sheer white silk gauze over her stays and a beribboned stomacher. Her hands are gracefully arranged in her lap, and her half-smile, glowing skin, and dark eyes are skillfully captured. She's presented as a beautiful, charming lady, and she is. Unfortunately, there's no record of Madame's reaction to the painting, or of the husband who most likely commissioned it. Still, she must have been pleased. 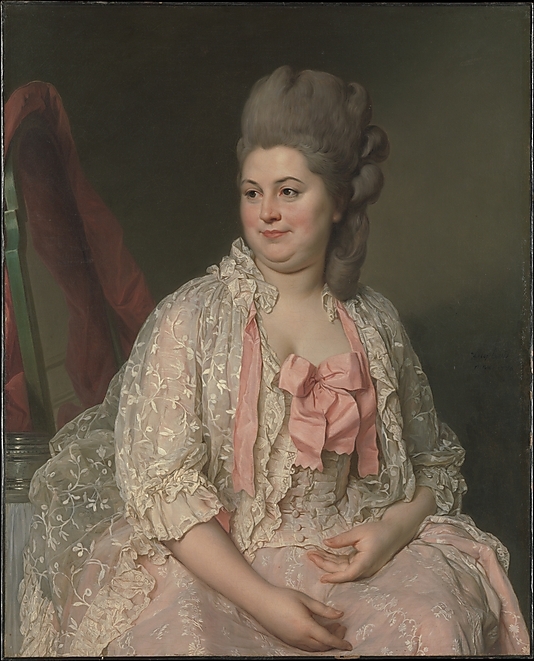 The artist exhibited this portrait at the Salon of 1777, where, as the Metropolitan Museum of Art's gallery label notes, "it was admired for its truthfulness and the delicate treatment of the draperies." Successful portrait painters were required to flatter their subjects the same way a modern art director Photoshops. Clearly Madame didn't request it, or require it, either. Beauty comes in all sizes, and vive le différence! Above: Madame de Saint-Maurice, by Joseph Siffred Duplessis, 1776. Metropolitan Museum of Art. She looks relaxed and radiant! I have been collecting images of 'larger than average' waistlines for quite some time, so I can point people to them when people complain that "everyone was sooo skinny back then!! (eyeroll)"
It's harder to find them, but not impossible! Love this post!